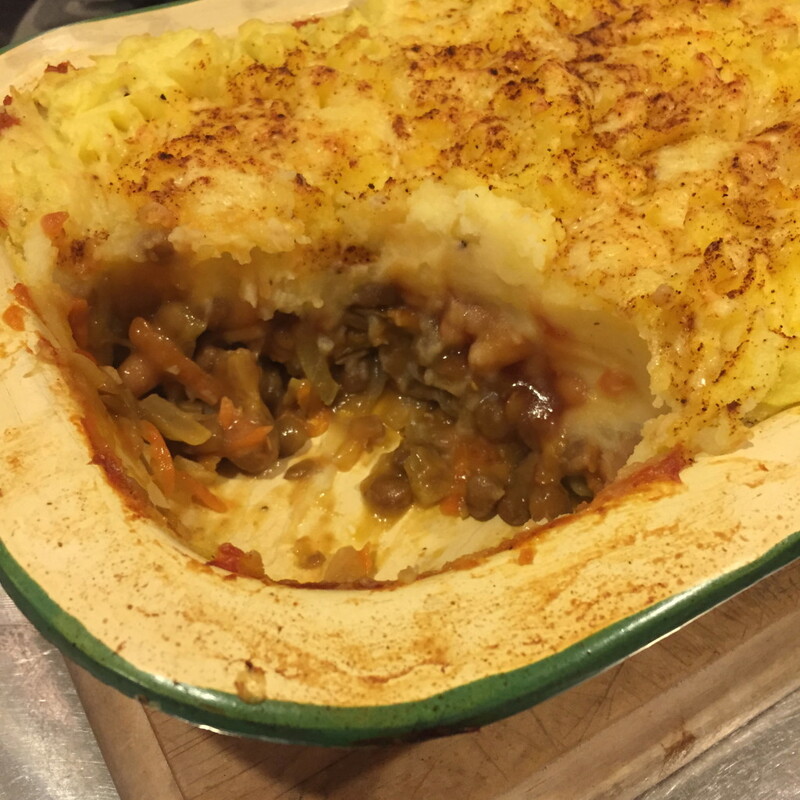 This is a vegetarian twist on the Cottage Pie, or Shepherd’s Pie. Some people refer to this vegetarian variety of the pie as a ‘Shepherdless Pie” (I guess the name “Cottageless” didn’t have the same appeal, and I certainly hope there are no shepherds in the pie). The brief backstory is that the difference between Shepherd’s Pie and Cottage Pie is the meat content; Cottage Pie contains beef, and Shepherd’s Pie contains lamb (and, if the pie is topped with breadcrumbs, it is known as a Cumberland Pie, then at some point in history, the pies were made with pastry instead of potato). This vegetarian version uses lentils instead of meat, with added vegetables and seasonings, and with no shepherds in sight. Peel potatoes and cook in salted water. When soft, mash with butter and pepper, and a small amount of milk, so the mixture is firm enough to spread on the top of the pie. In a fry pan, cook the onion in butter, and then add garlic and grated carrot. Cook until soft. Add the add flour to thicken, and stir all together. Add tomato paste. Drain lentils and add into fry pan. Crumble in ½ a vegetable stock cube. Add a few chilli flakes, soy sauce, and salt and pepper, and enough water to mix to a thick consistency. Spread lentil mixture in the bottom of a 20 x 14 cm oven dish. Next add a layer of baked beans, then the mashed potato as the top layer of the pie. Fluff up the top of the potato with a fork, then sprinkle a small amount of grated tasty cheese on top, and a dusting of paprika. Bake in oven at 180 degrees Celsius for 15 minutes until the pie is heated through. To brown the top, grill at 220 degrees Celsius for 5 minutes.